Alex Pollock says that It's High Time to "Audit" the Federal Reserve. I'm glad to see that this headline puts the word "audit" in quotes. It suggests what Mr. Pollock means by "audit" differs from how most people understand the word: a complete and careful examination of the financial records of a business or person (Merriam Webster). The calls in Washington to “audit” the Federal Reserve are not for a narrow, bean-counting review of the institution’s financial statements. Good. Progress has been made: the Fed's books are in order. Nothing scandalous to report (sigh). How else then to "audit" the Fed? Let's be honest here. There is nothing new to discover in further auditing. This movement is motivated by what they perceive to be bad monetary policy. 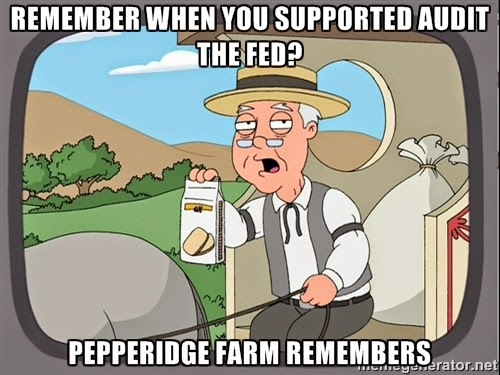 It doesn't even make sense to say we want to "audit" the Fed's policy because the policy is already transparent (which is, after all, what permits critics to label it "bad" in the first place!). There is, of course, nothing wrong with critiquing Fed policy. Indeed, there are many economists working inside the Fed that critique various aspects of Fed policy all the time. And, as we all know, members of the FOMC can hold very different opinions ("hawks" and "doves"). Thoughtful critiques of policy should be welcomed. Policymakers and researchers at the Fed do welcome them. Moreover, I'm all for full accountability. The Fed should be accountable to the American people--it is, after all, a creation of the American people through their representatives in Congress. But as I have said, the issue here is not about accountability. It is about a group of individuals who want to see their preferred monetary policy adopted. That's fair enough. I just ask that they be honest about their motives. It has nothing to do with audits or accountability. My pal Roger Farmer has a lot of good ideas, but he doesn't always use the best language to express them. In a recent post, for example, Roger asserts the following. Participation is a voluntary choice. Unemployment is not. The idea that unemployment is voluntary is classical nonsense. I do not like this language. But before I explain why I feel this way, let me first describe what I think Roger is trying to say. I think he means to say that recessions are socially inefficient outcomes, manifesting themselves primarily in the form elevated levels of unemployment and not in low participation rates. The unemployed are people without good-paying jobs, but looking for good-paying jobs. Good-paying jobs are relatively scarce in a recession (especially for individuals with lower skill sets--the young, those without advanced education, etc.) If you were to interview the unemployed during a deep recession and ask them how they're feeling, most of them would are likely to reply that they are not doing well relative to when they were employed. Economists (classical or otherwise) would say that recessions are welfare-reducing events for most people. The "classical" idea that there is little a government can or should do to help society in a deep recession is nonsense. I think this probably captures Roger's view fairly well. Notice, however, that nowhere did I employ the adjectives "voluntary" or "involuntary" to describe labor market outcomes. I did not because these labels are not useful (which I why we do not see these terms used in the labor literature). Indeed, want to go a step further and argue that the use of these labels might be worse than useless. Now let me explain why I feel this way. Let's start with some things I think we can all agree on. First, people are endowed with some time, T. Second, there are competing uses for this time. Let me assume, for simplicity, that there are three uses of time: work (e), search (u), and leisure (n). Think of "work" as time devoted toward producing marketable goods and services, "unemployment" as searching for work, and "leisure" as producing non-marketable goods and services. Third, we can all agree that we face a time constraint: e + u + n = T.
Now, Roger seems to be saying that people have a choice to make when it comes to allocating their time to either work (e = T) or leisure (n = T), but that they have no choice in determining time spent unemployed (u = T). Moreover, the idea that people may choose u = T constitutes "classical nonsense." But is this really what he means to say? Let's start with a basic neoclassical model. In this abstraction, individuals and firms meet in a centralized market place and individuals are assumed to know where to find the best price for their labor. Put another way, there is absolutely no reason to devote precious time to searching for work. To put it yet another way, the neoclassical model was never designed to explain unemployment--it was designed to explain employment (and non-employment). And so, in the neoclassical model, where search is not necessary, individuals rationally choose u = 0. Now, you may think this is a silly abstraction and that you want to impose (involuntarily) the state u = T on some individuals. But why? Unemployment is not idleness. Unemployment (at least the way the LFS defines it) constitutes the activity of searching for work--it is a form of investment (that hopefully pays off in a better job opportunity in a world where finding jobs is costly). Individuals not working and not searching are counted as out of the labor force (and even these people may not be "idle" because they might be doing housework or schoolwork, etc.). So back to our neoclassical model. Since there is no unemployment, the time-allocation problem boils down to choosing between work and leisure. Depending on idiosyncratic considerations (the price of one's specific labor, wealth position, the opportunities for home production, schooling, etc. ), some individuals choose work and others choose leisure. In the neoclassical model, these idiosyncratic "shocks" are largely beyond an individual's control. If the demand for your labor declines, it will cause the market price of your labor to fall. You will not like that. The shock is involuntary. BUT, you still get to choose whether to work at that (or some other) lower wage, or exit the labor force. To take another example, suppose that a source of non-labor income suddenly vanishes (involuntary). You may now be compelled to take that lousy paying job. Should we label this outcome "involuntary employment?" If so, then what next? Involuntary saving? (oops). Are all choices to be considered "involuntary?" This is not the way we (as economists) want to go, in my opinion. In my view, it makes more sense to view choices as voluntary and responsive to the incentives imposed on individuals by the economic environment. If we want to view anything as "involuntary," it would be exogenous changes to the environment that reduce material living standards. If circumstances change for the better, welfare increases. If they change for the worse, welfare declines. In either case, people can be expected to allocate their scarce time toward the activities that promise the highest expected payoff. What room is there left for the "voluntary/involuntary" distinction? None, in my view. Let's stick with the neoclassical model for a bit longer, but tweak it the way I did here to permit multiple equilibria. Now, this is right up Roger's alley. All individual choices here are rational and "voluntary." But this doesn't mean that the economy operates perfectly all the time. Indeed, the economy might get stuck in a bad equilibrium, where employment is low, non-employment is high (and unemployment is still zero). What would Roger suggest here in the way of labels? Is this a model of involuntary leisure? How does this label help us understand anything? I argue that it does not. Alright, so I don't find the "involuntary leisure" label useful. So what? Well, I don't want to make too much of this, but I think such labels can lead to muddled thinking. The label "involuntary" suggests that individuals may not respond to incentives (after all, they evidently have no choice in the matter). I think it's better, from the perspective of designing a proper intervention, to view the individual's circumstances as beyond their control, but to respect the fact that they are likely to respond to altered incentives. We are economists, after all -- why would we not interpret the world this way? People demonstrably do respond to incentives! I could go on and talk at length about abandoning the neoclassical assumption of centralized labor markets and replacing this construct with a decentralized search market. There is a big literature on labor market search and I'm not about to review it here. If you're interested, read my Palgrave Dictionary entry on the subject here. Suffice it to say that I find no value in interpreting an individual's state of unemployment as "involuntary" either. There are all sorts of jobs out there and I think people rationally turn "ill-suited" job opportunities down to search for better matches (the way I did, when I lost my construction job in the 1981 recession). Sometimes, people get "discouraged" and exit the labor force. These are all choices that people make relative to the circumstances they find themselves in. If we want to design programs to help the unfortunate (some of whom are employed or out of the labor force), then we want to design a system that respects incentives. What's that you say? You don't believe that incentives matter? Not for the unemployed? This is what I call nonsense. Consider, for example, the well-known "spike" in unemployment exit rates at the point of unemployment benefit exhaustion (see David Card here: "In Austria, the exit rate from registered unemployment rises by over 200% at the expiration of benefits..."). We see clear evidence that the unemployed do respond to incentives--they do have choices, especially in an economy with so many competing uses for time. Interpreting unemployment as "voluntary" does not mean that we are to have no compassion for the the unemployed. We feel bad for anyone (employed or out of the labor force too) who face terrible circumstances beyond their control. What it means is that we should measure economic welfare based on consumption (material living standards), not time allocation choices. It means is that we understand and respect the fact that people make choices based on the incentives they face. It means that a well-designed policy should respect these incentives. Let me sum up here. Commentators attach the label "involuntary" to unemployment to emphasize the fact that the unemployed are not typically happy with their circumstances. Fine. But then can the same not be said of many people who find themselves "involuntarily" employed (the working poor, for example) or "involuntarily" out of the labor force (looking after a sick relative, for example)? If so, then how can one unequivocally proclaim that "participation is a voluntary choice, unemployment is not?" It makes no sense to me. I want to ask Roger to stop using bad language. From Barron's yesterday we have this lovely headline: Two Fed Presidents Contradict Each Other on Same Day. Given uncomfortably low inflation and an uncertain global environment, there are few benefits and significant risks to increasing interest rates prematurely. Let's be confident that we will achieve both dual mandate goals within a reasonable period of time before taking actions that could undermine the very progress we seek. This balanced approach framework supports taking steps to remove the extraordinary amount of monetary accommodation currently in place. The next phase in this process is to move the federal funds rate off its near-zero setting. While the FOMC has made no decisions about the timing of this action, I continue to support liftoff towards the middle of this year due to improvement in the labor market, expectations of firmer inflation, and the balance of risks over the medium and longer run. I want to evaluate these two views in the context of a Taylor rule. The Taylor rule is simply a mathematical representation of how the Fed should (or will) set its policy rate in relation to the current state of the economy as measured by inflation gaps (inflation minus target inflation) and output gaps (output minus potential output). Every FOMC member presumably has a Taylor rule in mind if for no other reason than the existence of the Fed's dual mandate (the Congressional mandate that the Fed strive to stabilize inflation and employment around some long-run targets). where i(t) is the nominal interest rate (IOER) at date t, p(t) is the inflation rate at date t, and y(t) is the (logged) real GDP at date t. The starred variables are long-run values associated with the real interest rate (r*), the inflation target (p*) and the level of "potential" GDP (y*). The parameters A and B govern how strongly the Fed reacts to deviations in the inflation target [p(t) - p*] and the output gap [y(t) - y*]. Let me start with the hawkish view (see also this presentation by Jim Bullard). According to this view, y(t) is below, but very close to y*. So, let's just say that the output gap is zero. PCE inflation is presently around p(t) = 1%. We all know that p* = 2%, so the inflation gap is -1%. Now, we have some leeway here with respect to the parameter A, but let's assume that the Fed responds aggressively to the inflation gap (consist with the Taylor principle) so that A=2. Now, if we think of the long-run real rate of interest as r* = 2%, then our Taylor rule delivers i(t) = 2%. Presently, the Fed's policy rate is i(t) = 0.25%. So, if you're OK with these calculations, the Fed should be "lifting off" (raising its policy rate) right now. Oh, and don't call it a "tightening." Instead, call it a "normalization." After all, even with i(t) = 2%, the Fed is still maintaining an accommodative stance on monetary policy because 2% is lower than the long-run target policy rate of r* + p* = 4%. What about the doves? Because doves like to emphasize the unemployment rate, the argument of a large negative output gap is now harder for them to make (see also here). But one could reasonably make the case that the output gap--as measured, say, by the employment rate of prime-age males--is still negative, let's say [y(t) - y*] = -1%. Let's be generous and also assume B=1. Now, if we continue to assume r*+p* = 4%, our dovish Taylor rule tells us that the policy rate should presently be set at i(t) = 4% - 2% - 1% = 1%. So the recommended policy rate is lower than the hawkish case, but still significantly above 25 basis points. Thus, if we take the historical Taylor rule as a decent policy rule (in the sense that historically, it was associated with good outcomes), then one might say that the hawks have a stronger case than the doves. Both camps should be arguing for lift-off--the only question is how much and how fast. On the other hand, something does not seem quite right with the hawk view that things are presently close to normal and that the Fed should therefore normalize its policy rate. All we have to do is look around and observe all sorts of strange things happening. The real interest on U.S. treasuries is significantly negative, for example. Indeed, the nominal interest rate on some sovereigns is significantly negative. This does not look "normal" to a lot of people (including me). And so, maybe this is one way to rescue the dovish position. 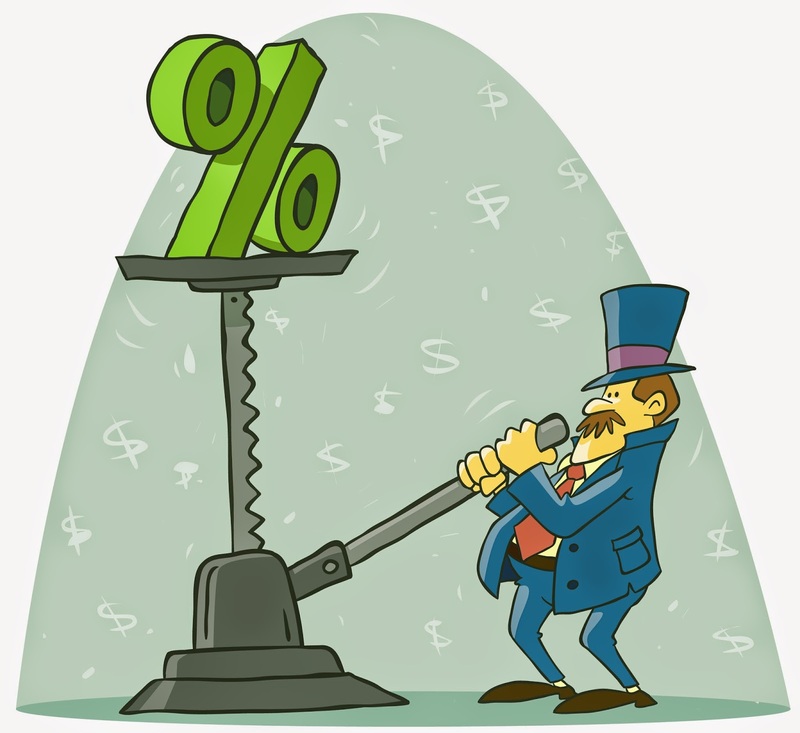 For example, one might claim that the real interest rate is now lower than it normally was, e.g., r* = 1%. (see this post by James Hamilton). If so, then this might be used to justify delaying liftoff. Regardless of positions, everyone seems to assume that liftoff will occur sooner or later. But as Jim Bullard observed here in 2010, the promise of low rates off into the indefinite future may mean low rates (and deflation) forever. Few people seem to take this argument seriously except for, gosh, the predictions seems to be playing out (see Noah Smith's post here). For those who hold this position, the question of liftoff becomes more like now or never, rather than sooner or later. To conclude, we see that the contradictory views expressed by Evans and George might spring from something as basic as a disagreement on what constitutes the "natural" rate of interest r*. Further disagreement might be based on the appropriate measure of "potential" y* and on the appropriate size of the parameters A and B. There are also other concerns (like "financial stability") that are not captured in the Taylor rule above that might lead Fed presidents to adopt different views on policy. In the immortal words of Buffalo Springfield: "There's something happening here, What it is ain't exactly clear." What this something is, its root cause, and what might be done about it seems rather elusive at the moment. And I mean elusive not in the sense that nobody knows. I mean in the sense that everyone seems to have an opinion, most of which are mutually inconsistent. It makes for interesting times, at least.